Ok brothers, this $20 gadget rocks. I did some testing with this cable knob looking at Orion at 150x and 300x. I went back and forth and back and forth with my slice of wacky noodle donut, zip tie, skinny chip clip and this knob cable. I've been using my wacky noodle donut the past year but you still have to touch the thing which causes more vibration than the zip tie. The zip tie causes less vibes than all the other tricks and gadgets I've tried before but you can't turn it to do course focusing unless you cut the zip tie real short. And no matter what attaches to the knob you still have to reach for it in the dark and almost always knock the bloody thing. With this knob cable, the thing is right by your chest or stomach with your hand right there not having to reach for anything. No more knocking the scope in the dark! 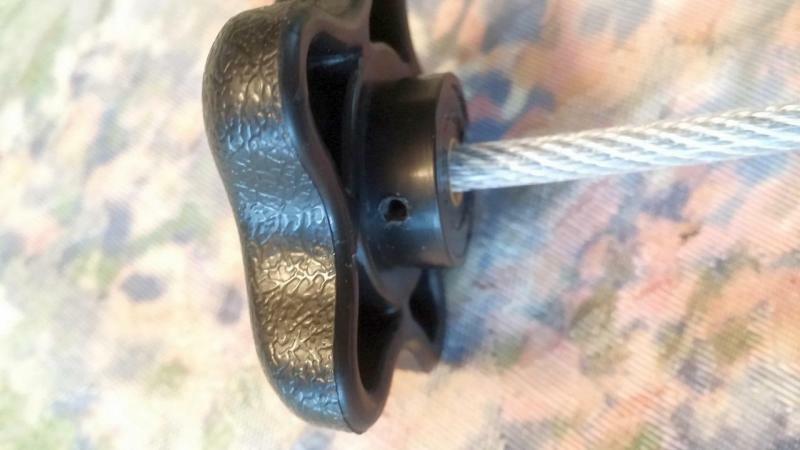 And gently turning or nudging the knob causes no more vibration than the zip tie! And you can turn it completely for course focusing without letting go of it or fiddling with attached gadgets. 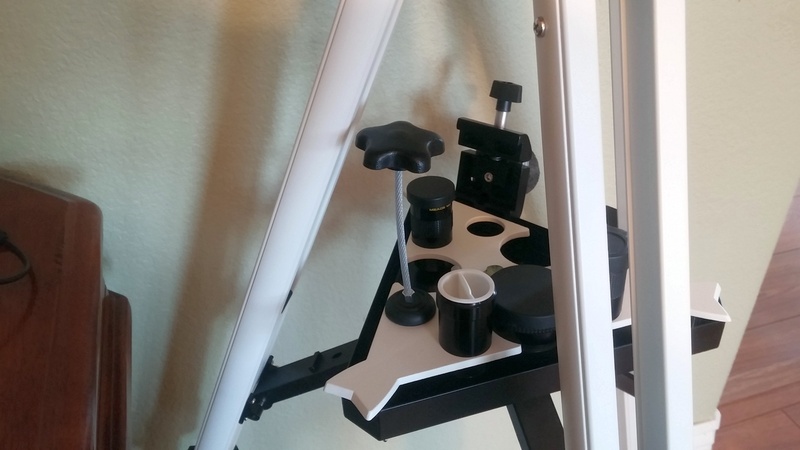 Also, it stores nicely vertical in a 1.25" eyepiece hole in a tripod eyepiece tray. Is it as slow as a $300 micro focuser? No. But this is the best alternative to a $300 micro focuser I've experienced yet. Hands down. Make sure you buy enough, as in a spare or even 2 spares. I have found similar here and it seems that someone makes them then after a few months stops making them and moves on to something else. I bought 4 or 5 to cover myself for 3 ETX scopes. Never regretted doing so. Where does one obtain such a wonderful attachment? I got it from an eBay seller who makes them. He's out of them now so his listing is gone but here's the link to his previous listing. Don't know if it'll work for you. Scroll down. Edited by Cyberpunk, 23 January 2019 - 10:45 AM. The seller just listed a batch of 20 more on Ebay. Ordered mine this morning, thanks! Just ordered one for my C6 - thanks for sharing! 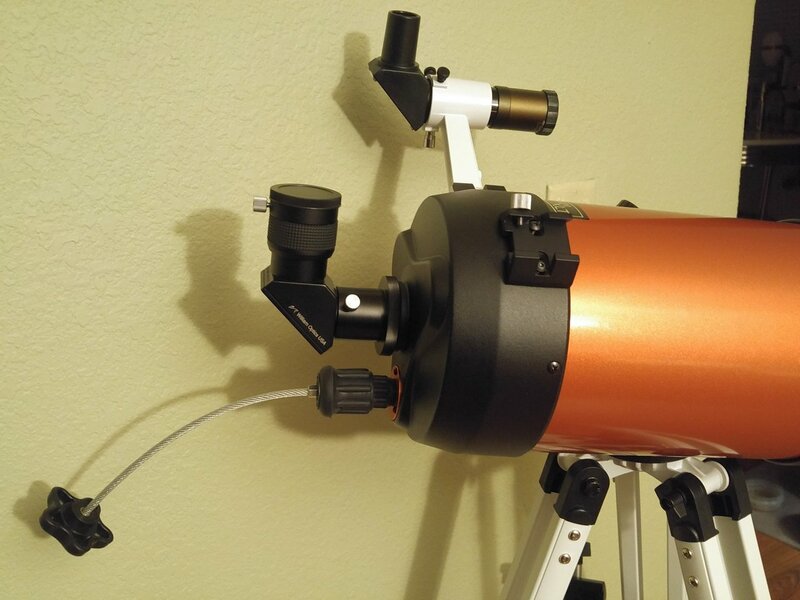 I have a Celestron 8" Evolution that shakes like mad. Yea brother, I don't think they should make single arm mounts for anything larger and heavier than a 6". It squeezes on just like it shows in my pic. Easy to push on and pull off. 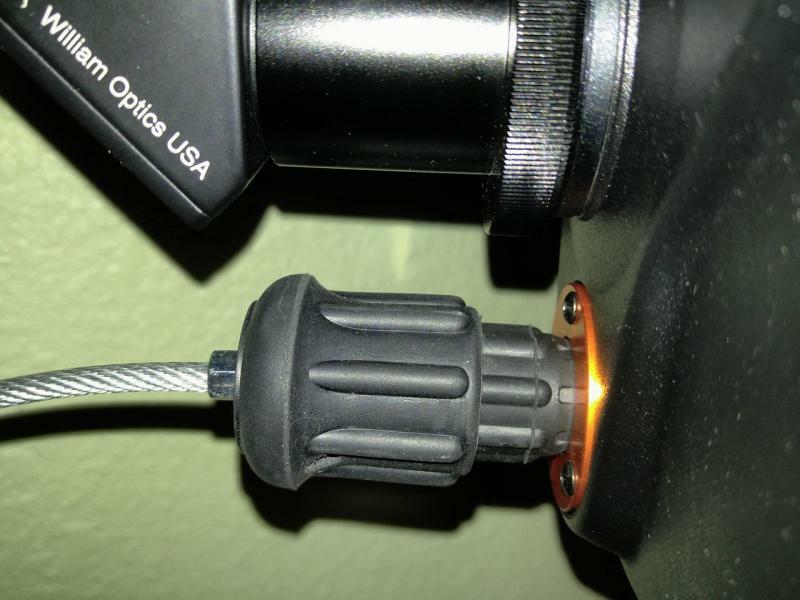 The eBay listing pics show it pushed over a Meade OTA with their smooth metal focus stem (set screw holds the metal stem knob on). I am disappointed with my focus cable. It arrived yesterday and I tried it in 25 degree F weather. There is considerable backlash when using it. If turned clockwise, I could visibly see it turn the focus knob counter-clockwise after I released it, so focus was lost. I don't know if it was due to the cold or because it was new, but so far it has not been a good purchase for me, sad to say. Where are you noticing the backlash? Is the crutch tip slipping on the focus knob, too much flex in the cable, or is the backlash in the mirror movement? I ordered one for my C-8. It's the flex in the cable. Brother, I used it a week ago when temps were in the teens here and no issue. It worked perfectly. The only way what you have described could happen is if you're bending the cable too much while using it. If you're bending it down or to the side at a 45 to 90 degree angle or more you will get pull back from the cable twist. It's not designed to be bent like that. The reason the 6" or 7" cable is flexible is so your hand will not transfer vibrations when touching the knob. If it were a solid rod vibes would transfer to the focus stem on the tube. That's why slow motion controls/knobs on mounts are almost always flexible, so that when using them vibes won't transfer to the scope. They're not designed to be bent much when using them. Same with this focus cable. If you leave it dangling straight out and use it that way without bending it hardly it works as intended. 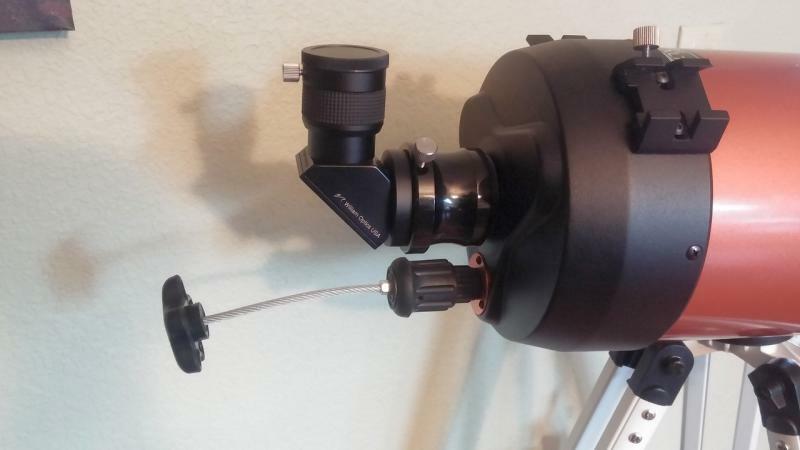 The bro who makes this got the idea from Meade's ETX scopes that have a similar but smaller cable knob for their ETX systems that have been used for years. He just made a bigger longer version for all the larger SCT's from any make. I suppose I need to pull it up so it is straight if it droops, then. Edited by K4PDM, 30 January 2019 - 09:34 AM. Bro, you don't have to really pull it up. It's ok if it droops on it's own. Just don't force it down or to the side much and it'll work fine. I'm using it on a C6 and my personal preference is that I don't like the cable being so long. It rest against my stomach unless I stand to the side slightly. So I cut 3 inches off the cable so it's 4.5" long now instead of 7" long. However, too short and I will defeat the purpose of it being flexible, lol. You just unscrew the tiny hex screw in the side hole of the knob and pull/unscrew the cable out. Cut no more than 3" off (maybe 2" or 2.5" instead? Matter of preference) and stuff/screw the cable back into the knob hole threads and tighten down the hex screw to lock it in. I like this length better. For the large 10" to 16" SCT's on fork mounts the original length is probably fine. I haven't tried it yet under the stars but when I make sure that I am not further bending the cable, I can see no backlash when I watch the focusing knob. I think it will be OK after all, thanks. I’ve got a spare cable from an alt-az mount. Shouldn’t be too hard to add a coupler to it. Yeah brother, in many or even most cases this is totally true. 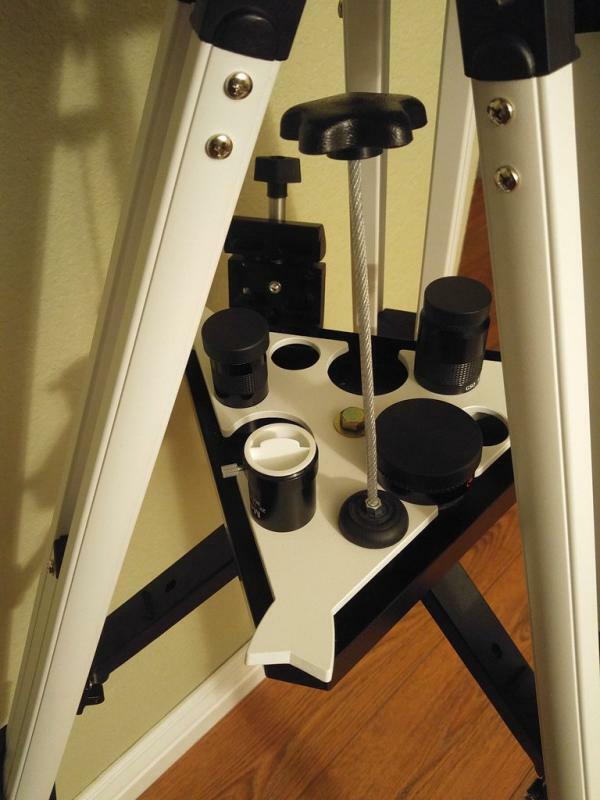 And thanks for reminding me that I forgot to mention in my original post that this (or any trick or gadget) really shines with Alt/Az mounts (Twilight 1, 2 or Nexstar, etc.) and other lighter duty mounts. If you have a medium to heavy duty GEM mount or a Fork mount chances are you don't really need a vibration damping trick. But the vibe damping is only the secondary purpose for this thing. The main purpose is for slowing the focusing much like the Aluminum Scope Stuff donut. The fact that you're not touching the actual focuser stem just helps a lot with vibration. Even with heavy duty Fork and GEM mounts you're going to get a little vibration touching the stem at high powers. Granted, it's usually not enough to be annoying, but this cable knob will just make it even less than the little it may be. I like this because I use lighter and more portable mounts. ES Twilight 1 and a lighter Celestron Omni AZ mount. I don't like GEM's with their poles and weights sticking out swinging around but then I don't get the benefit of their stability and sturdiness. My choice. Lighter weight and more portability is more important to me and others. And then there's Celestron, Meade and others that have a habit of selling scopes with mounts that aren't really as capable as they should be for the scope they come with. A Nexstar with a C5 or C6 may be fine but a C8 in IMO crosses the line in size and weight for a Single Arm Mount. Mucho vibration. So us poor devils in these situations can benefit from a gadget like this until we can afford to get a beefier more appropriate mount, if we choose to. Edited by Cyberpunk, 03 February 2019 - 11:42 AM. Used my cable the other night. Worked great, except near zenith where it was in the way. Just popped it off until I got back to a lower altitude. Happy with my purchase. Brother, I shortened mine as described in my post #19 above. I like it better at 4" to 4.5" in length rather than 7". It works just as well but stays off my stomach, lol.